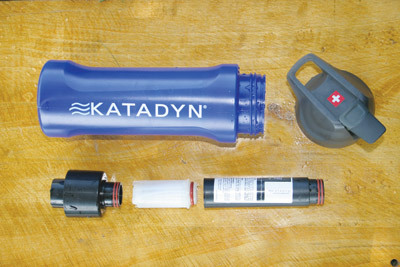 Katadyn MyBottle Purifier filters and purifies drinking water almost instantly. Simply dip the bottle full, insert the filter (attached to the screw-on cap), flip open the mouthpiece, and squeeze. No chemicals to add, no waiting, and no pumping. 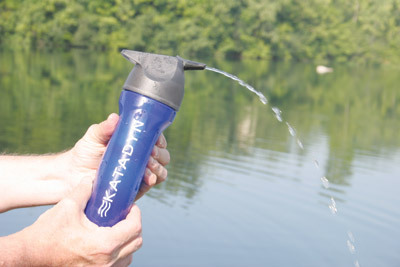 Simply fill the bottle and squeeze out a stream of pure drinking water. 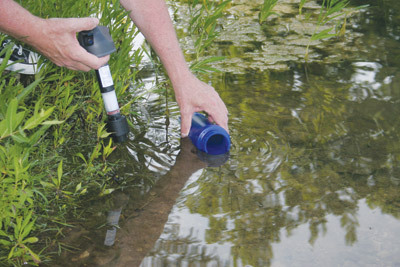 The carbon prefilter removes sediment and reduces chemicals to clean up the taste. Then the second-stage cyst filter removes Giardia and other contaminants down to 1 micron in size. Finally, the ViruStat® microbial water purification cartridge uses iodine resin to kill 99.9999 percent of waterborne bacteria and 99.99 percent of viruses. Adheres to strict EPA microbiological water purifier test protocols. To test the MyBottle Purifier, we dipped it full at a nearby lake, flipped open the soft mouthpiece, and squirted in a healthy mouthful. The water tasted fine, with no muck or iodine flavor.